The Tubebarrier is the new temporary flood barrier. Which offers preventive measures against flooding and water damage. You have found us because you are searching for a solution, a preventive measure against flooding and water damage. You are a few clicks away from solving your problem, preventing flooding. Who can use the TubeBarrier? Flooding from extreme rainfall is the fastest growing climate problem for many manufacturers. 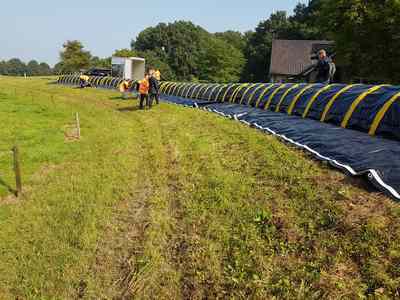 With many companies in risk areas flooding is high on the calendar, but what can they do with a temporary flood Barrier? Every company can be faced with flooding. And what do the local governments and water boards do to prevent flooding? These are just a few questions that we, as a supplier of temporary flood Barrier, ask when meeting with these parties. a 100 meters in an hour with 4 people. This means you can extend the flood barrier for as long as you like. No pumps and or a lot of manpower needed to install the flood barrier. Standard sized and stackable therefore space saving. You just need to call and we will take care of everything! We have our own service on a high level with, installment, cleaning, storage and lease constructions. this means that you as a customer just need to call and we will take care of everything? Yes, that’s right everything! Our service goes further than that of any other supplier of temporary flood barriers, we therefore believe that we do not sell a product but provide a service. A service in which the customer is king. A service that can provide exactly what the customer wants. 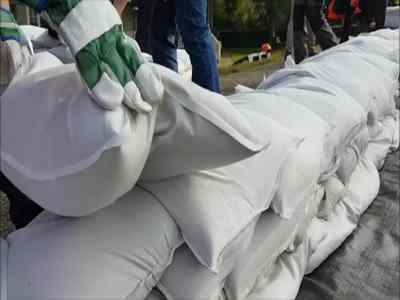 In some cases, sandbags may be a solution against flooding. Placing sandbags, filling sandbags and the enormous amount of people that you need to make that work require good logistics. That’s why you see that in this modern age the sandbag no longer is the solution of choice. Therefore will get a chance to prove itself in the battle against water. Our vision is to make the world a safer place by providing protection against increased flooding in a sustainable manner. We make this possible by developing durable and easy to use products and introducing them to the market. Products that provide protection against the growing global problem of flooding. Worldwide many parties (science, governments, companies) are searching for a simple solution to temporary hold back water. 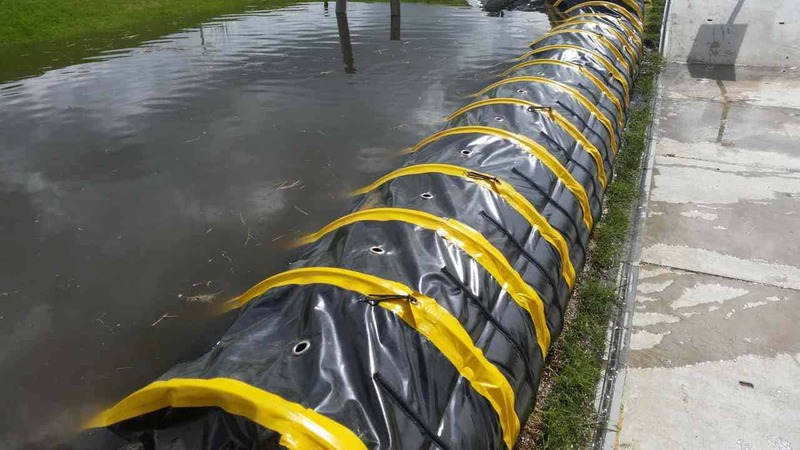 None of the temporary flood Barriers solutions is as unique as the Tube Barrier, which is easy to use without using resources as electricity, pumps or a lot of manpower, and will hold back water on all surfaces. Hence, there can actually be spoken of Fighting water with water! 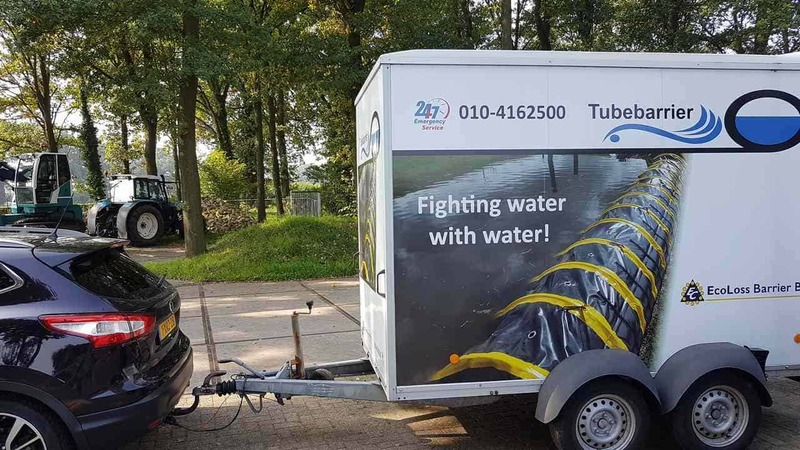 Would you like to see the Tubebarrier in action? 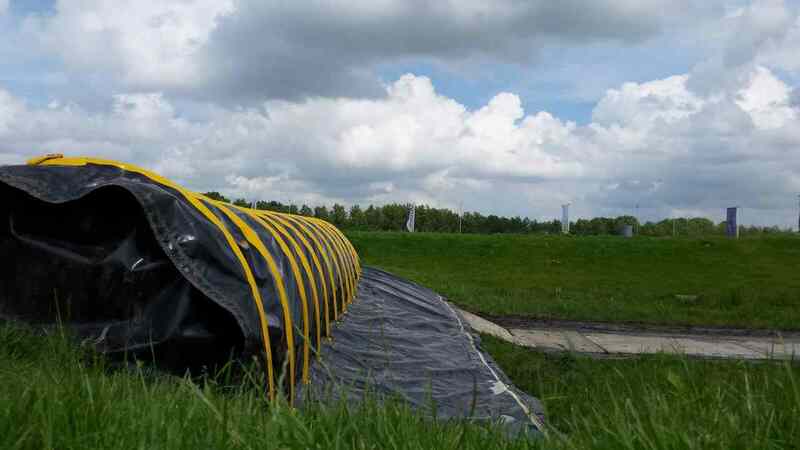 Would you like to attend a Tubebarrier demonstration on our test site?